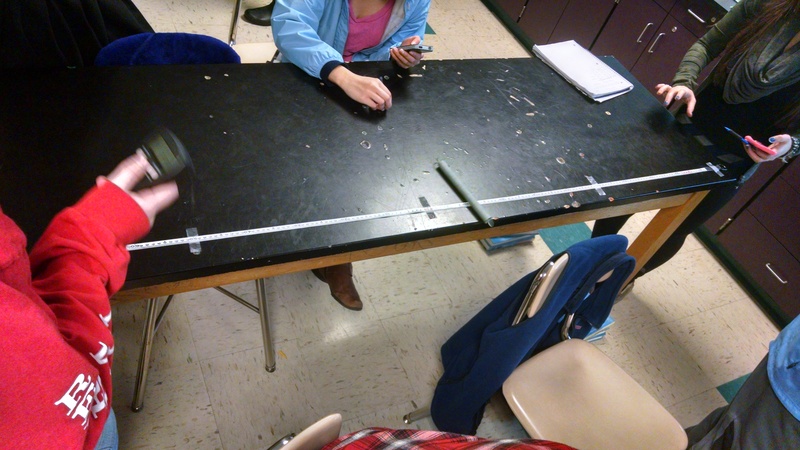 So as an introduction to our unit on acceleration, students were given this single-sentence lab: Does a spring rolling down an inclined lab table speed up? Justify your claim with evidence and reasoning. It was fantastic. Lots of discussion within and between groups about possible experimental designs and analysis. On Friday, we’ll share our experiments and results. NOTE: Last year, I did something similar, but used batteries instead of springs. Since the springs are hollow, they have a larger rotational inertia and accelerate more slowly than batteries. It takes about 5 seconds for the springs to travel the length of the 6 foot lab tables at a slight incline (about 3 volumes of Conceptual Physics texts high). I assume PVC pipe cut to pencil length would work well, too. 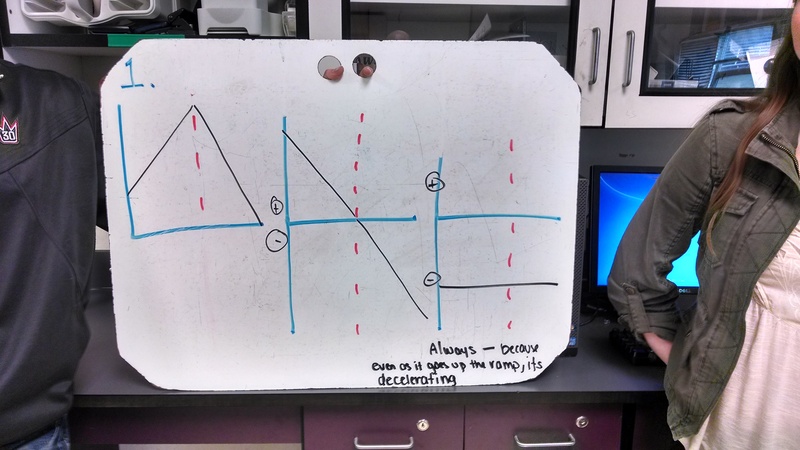 College-Prep Physics: This actually happened a few days ago, but it’s too awesome not to share. In an attempt to differentiate acceleration practice, I gave students a few choices. They could work on practice problems, work on graph interpretations, or do an acceleration challenge. Only one group of students from all 3 of my sections decided to go with the challenge. 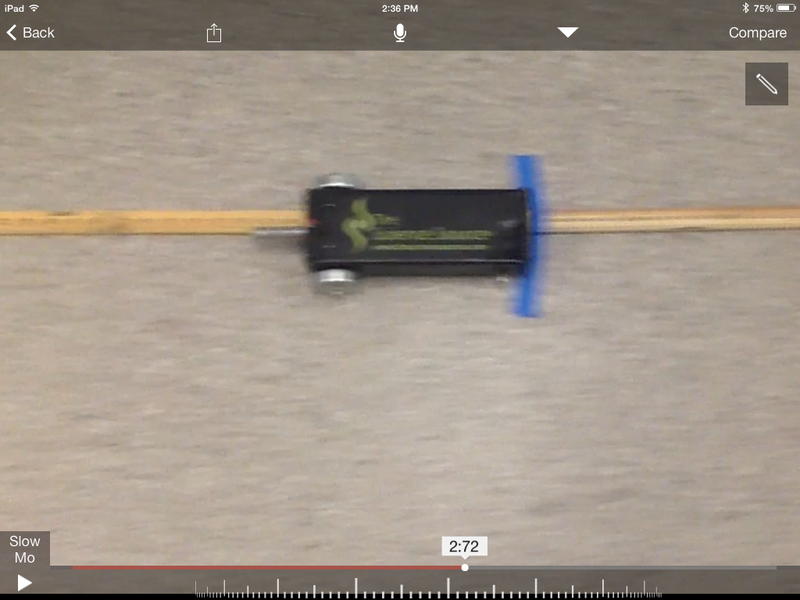 The goal of the challenge is to determine how far up the ramp to release a free-rolling cart so that it collides with a constant speed buggy at the bottom of the ramp. 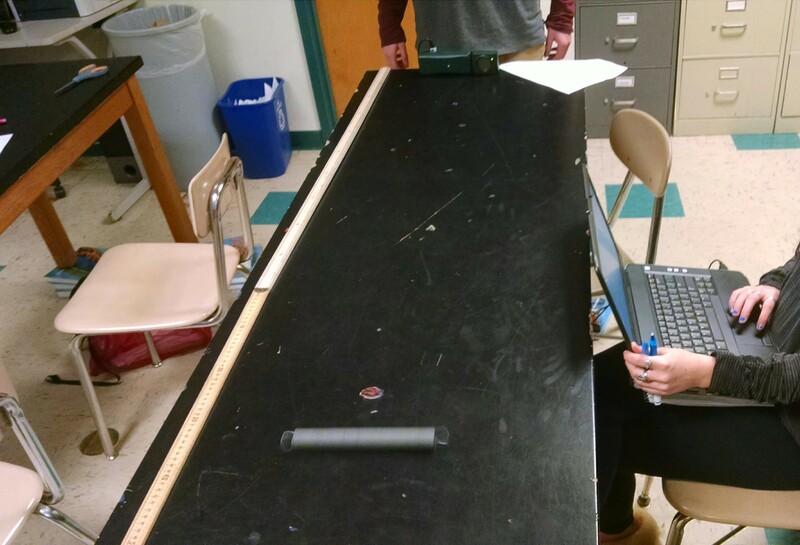 Students were not allowed to attempt any collisions, but could take data in order to determine the speed of the buggy and the acceleration of the cart down the ramp. 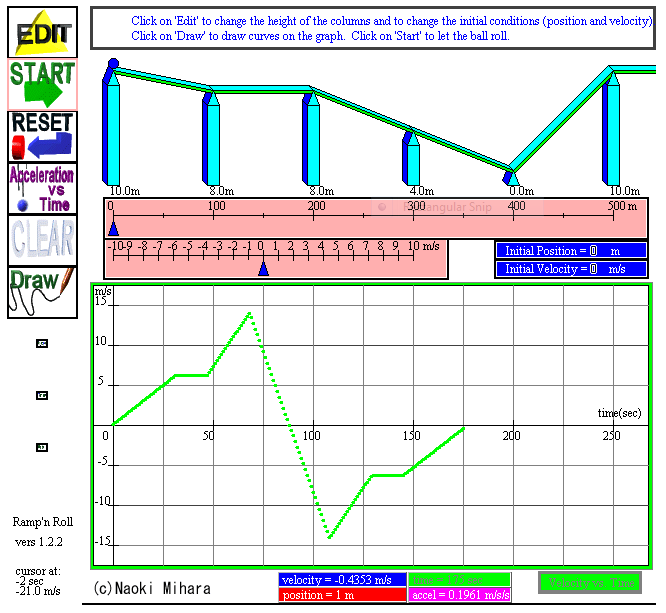 Collect position-time data by hand and calculate acceleration using kinematics. Then they input the data into Desmos and tried to find a parabola of best fit to model the cart’s position as a function of time. Next, they found the speed of the constant velocity buggy. Then I told them how far away from the crash point (X) the buggy would start. They then calculated the time it would take the buggy to travel to the X. Then they used that time and the Desmos graph to determine the distance the cart would travel down the ramp in the same time (e.g., the starting position of the cart). As you can see at the beginning of the post, they nailed it! College-Prep Physics: When an object moves with constant velocity, we know that the area under a velocity-time graph is the displacement. But what about for an object that’s speeding up or slowing down? 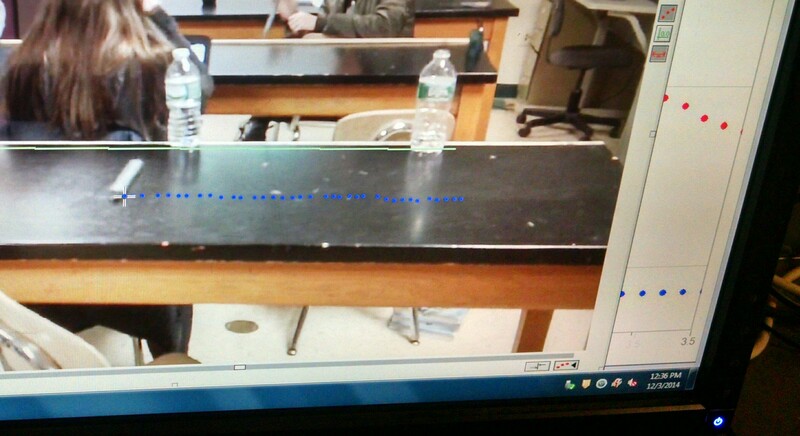 So we used Logger Pro and a motion detector to get position and velocity data for a cart rolling down a ramp. 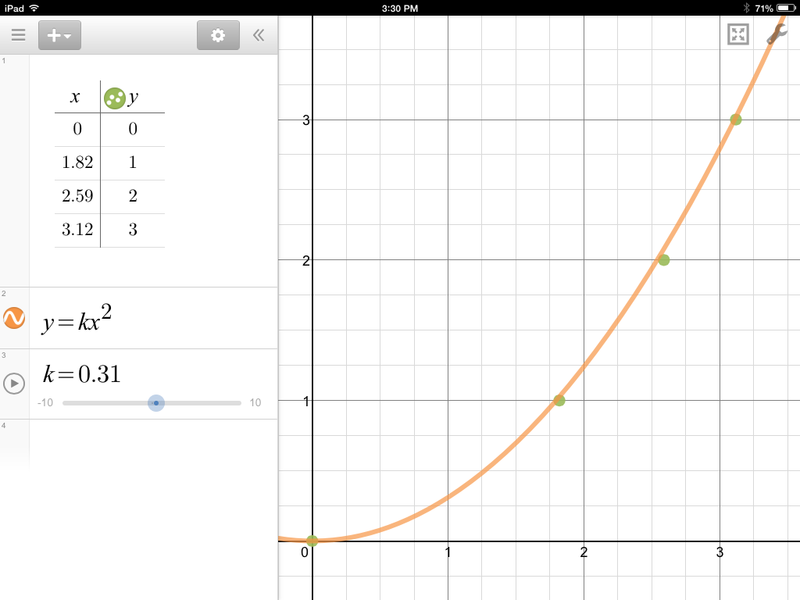 From the position graph, you see that the cart started at x = 0.2 meter and reached the bottom of the ramp at x = 1.0 meter — which makes the displacement 0.8 meter. 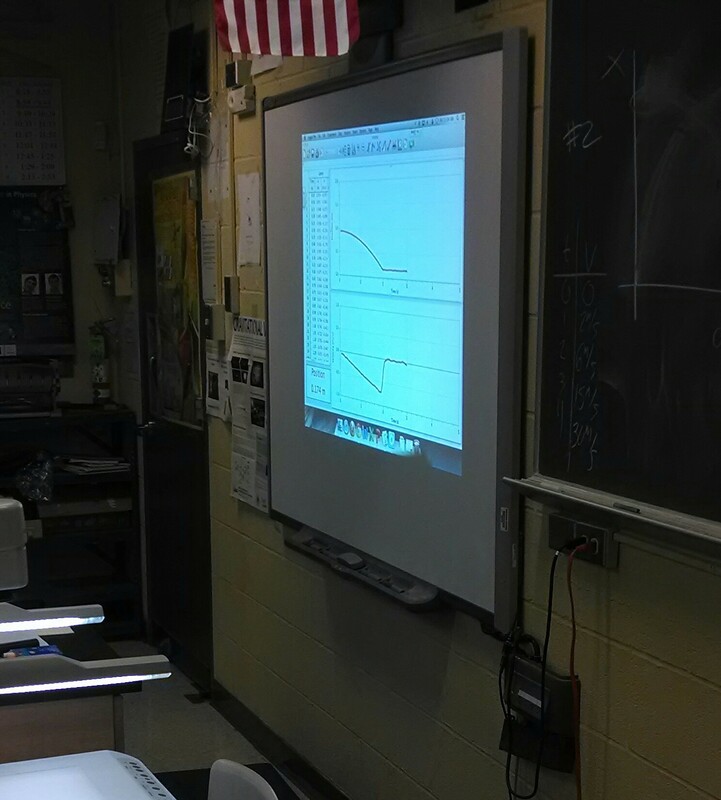 Then we used the area tool to find the area under the velocity graph and…. 0.79 meter! Now we’ve got a handy tool for solving for displacement and distance in acceleration problems. College-Prep Physics: Given the position-time graph (left), what do the corresponding velocity and acceleration graphs look like? We’ve been dealing with accelerated motion this week, so this problem is a throwback to the constant velocity motion from a couple of weeks ago. Several groups made the common mistakes shown here. College-Prep Physics: Ramp n’ Roll is a fun Java applet that lets you adjust the heights of the ramps, starting position of the ball, and initial position of the ball. 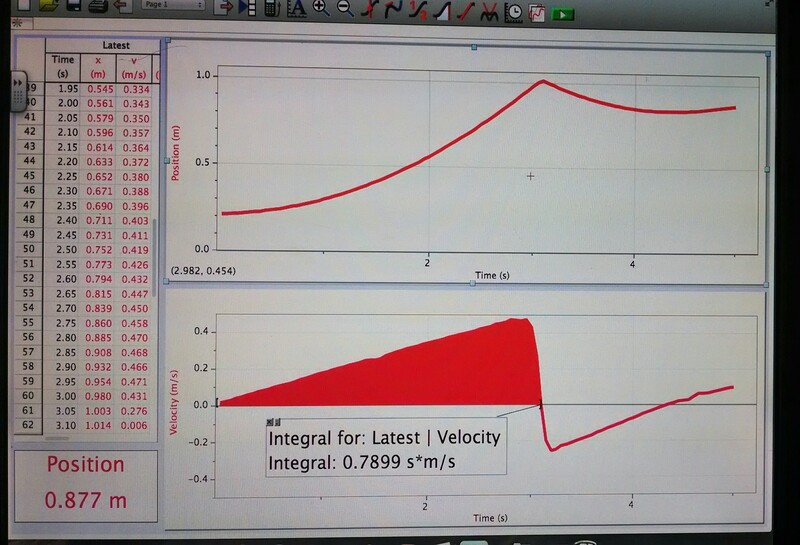 Then it animates the motion along with the graphs of position, velocity, and acceleration. 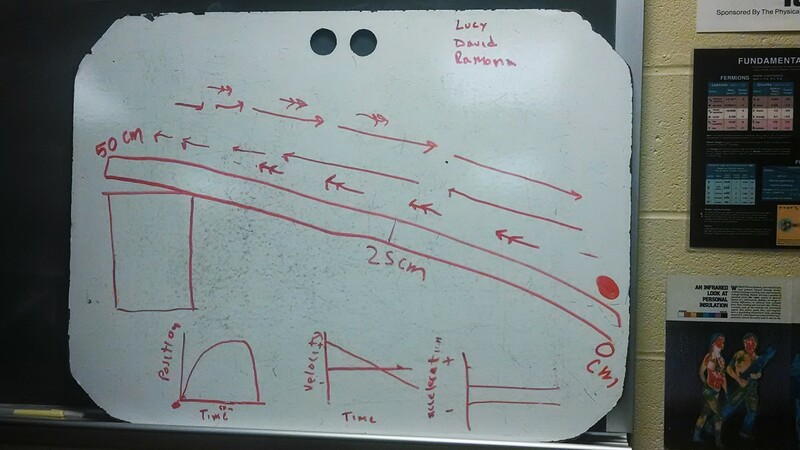 I’ve used it as formative assessment — give the class a ramp set-up and ask them to predict the velocity-time graph. Many thanks to NSTA’s Lab Out Loud for hosting the applet! Day 74: Can You Spot the Misconception?